Korčula is one of the most beautiful and largest among the Croatian thousand islands. The hole island is an ecologically well preserved garden where bird song and cicadas' chirping can be heard reminding us of the lost paradise. The island coast is 182 kilometres long with 195 unspoiled bays and promontories and 48 islets. The town of Korčula is the cultural-historical and tourist center of the island. It is one of the best preserved medieval towns in the Mediterranean. It has always attract travelers and settlers, Marco Polo, the famouse world traveler and explorer was born in this stone stone town. Besides the house of Marko Polo, the tourist can see a lot of Romansque, Gothic and Renaissance monumentes. Besides in hotels the guests can be offered accommodation in private rooms and apartments. You can hire an apartment or a room near the see or in the peaceful and quite green area not far from the old town of Korčula. Living in private rooms or apartments you have the opportunity to experience the traditional hospitality of our people. 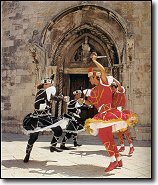 Korčula has preserved the long tradition of swords dances. Seamen and travelers from Korčula brought them to the island and adapted them according to their liking of imagination. The best know of these dances is Moreška which has been performed for more than four hundred years nad which probably originates from Spain. It has become a part of Korčula's identity and a symbol of its struggle for freedom in which the right, juctice and loyalty are the winners. It has been seen by nearly all islands visitors. The island is a real discovery for the sport and active holidays fans. You can enjoy swimming in the crystal clear sea that washes round its well-kept exciting flora and fauna and windsurf in the famous Maestral (northwest wind). There are walks through the pinescented woods and numerous caves to explore, once inhabited by the Stone-age cavemen. There are tennis courts and holiday sports facilities to be found in the vicinity of nearly every hotel.